that are already in the slot will be removed. If your game had custom equip types, you would need another solution to seal those slots. Where `x` is the equip type ID that you want to seal. Do you know if weapon fixing can be made toggle-able? I wanted to have certain equip slots on my characters fixed, but only at certain locations. How would I go about doing this? You could try the Dynamic Features script and add/remove the sealing feature using script calls. 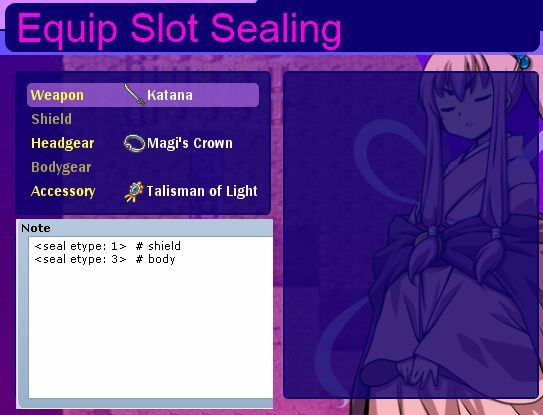 The ID for sealing is 54, and the data ID is the equip type ID specified in the equip type table in the Custom Equip Types script if you are using it. You can still refer to it to see the default equip type ID’s.